I. Meyers, A. L. -Elements of Modem Economics (1951) p. 61. 2. Robinson (Mrs.), J.V,e Economics of Imperfect Competition (5th). The demand is elastic when a fall in price increases the total amount spent or the total revenue of the seller (Price x Quantity). In this case. percentage change in the quantity demanded is greater than the percentage change in price. 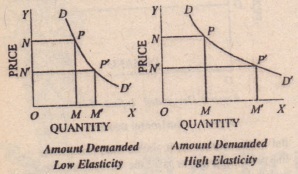 But when a fall in price leads to a small increase in the quantity demanded so that the total outlay of the purchaser. or the total revenue of the seller (i.e.. Price x Quantity) decreases, we say that the demand is inelastic. In this case, the percentage change in quantity demanded is smaller than the. percentage change in price. The elastic demand is said to be greater than unity (or one) and inelastic demand less than unity (but not less than zero). It is unity (or one) when the percentage change in price results in an exactly compensating per magenta change in the quantity demanded. In the words of Marshall.The elasticity (or responsiveness) of demand in a market is great or small according as the amount demanded increases much or little for a given fall in price, and diminishes mullet or little for a given rise ill price. There are few commodities, however. for which the -demand is inelastic. Demand cannot be entirely insensitive to changes in price. Instead of saying ‘inelastic” we should say ‘less elastic’. Elasticity is a matter of degree only. The axis of Y. It shows that, howsoever much the price may fall or rise. the amount demanded remains the same. In this figure. the amount demanded is 00′ both at price OP and at price. It may, however, be pointed out that both perfectly inelastic demand and infinitely elastic demand arc the two extreme limits which are seldom met within calorific and can be conceived of only theoretically. On the ether hand. in actual life we come across elasticity of demand which is somewhere between these two limits. i.e., it is more than zero but less than infinity.Shows a less elastic demand, commonly referred to as inelastic demand, while Fig. 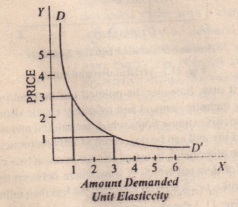 If.4 illustrates a very mastic demand denotes unity elasticity of demand. In all these diagrams, OX and or arc the two axes. 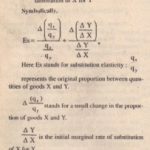 Along OX arc represented the quantities purchased and along OY the variations ill prices. In the price rills from I’M (= ON) to P’ M’ (= ON’) the quantity demanded extends from OM l() 0′ M’ which is a small increase as compared with the rail in price. The area OM’ P’ N’. 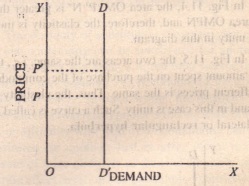 indicating total revenue received by the seller (or the total amount spent by the purchaser) alter the fall in price, is smaller than the area OMEN, the Tutankhamen received by the seller before the fall in puce, Thus, the demand is inelastic. (In a subsequent section entitled Measurement of Elasticity, this method of measuring elasticity of demand has been explained at length). In the two areas arc the same. i.c., the total amount spent on the purchase of the commodity at different prices i, the same. Thus, the elasticity of demand in this case is unity. Such a curve is called an equilateral. 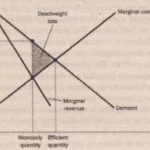 In some other cases, the marginal utility comes down very gradually, e.g., luxuries, Any fall in the price of such commodities is sure to extent the demand he demand is, therefore. elastic.